Gary Lawrence Brackett was born May 23, 1980 in Glassboro. He and his two older brothers were good all-around athletes, who excelled in baseball, basketball and football. The family rooted for the Philadelphia Eagles. Gary was very large as a boy and was crestfallen when he was banned from Midget League football because of his size. This problem persisted through junior high; prior to weigh-in Gary would try to sweat off the 10 or 15 pounds that put him over by running wrapped in trash bags. Gary followed two of his brothers, Greg and Grant, onto the Glassboro High football team. Their father, a Vietnam vet, suffered from PTSD and was sometimes hospitalized. He watched their games from a car in the parking lot because he could not deal with crowds. Gary played running back and linebacker. He also starred on the diamond and hardwood for the Bulldogs. One of his proudest moments for the football team was being able to wear Greg’s old Brackett 32 jersey. This actually caused a controversy in one game, when the opposing coach accused Glassboro of playing Greg for a fifth season. Gary came into his own as a junior, making All-South Jersey and All-TriCounty Conference two years in a row. At 5’ 11” and just over 200 pounds, Gary was a very good high school linebacker, but not exactly Division-I material. He was offered a chance to make the Rutgers football team as a walk-on, which he did. Gary quickly showed that the intangibles that made him a star at Glassboro translated well in the college game. By his junior year, he was captain of the Scarlet Knights defense, and was named the team’s defensive MVP as a senior. That wasn’t as impressive as it sounds—Rutgers went 1–11 in 2002 and were blown out in 10 of their 11 losses. In the spring of 2003, not a single NFL team called Gary’s name in the draft. Gary was invited to try out for the Indianapolis Colts as a free agent. He made the club as a special teams player. What should have been a happy time was a time of tragedy, however. In a 17-month span, Gary’s father died of a heart attack, his mother suffered a fatal stroke while undergoing a hysterectomy, and Greg was diagnosed with leukemia. Gary donated his bone marrow but it only delayed the inevitable. Refocused on football, Gary won a starting job in 2005 and was named NFL Defensive Player of the Week in Week 2. 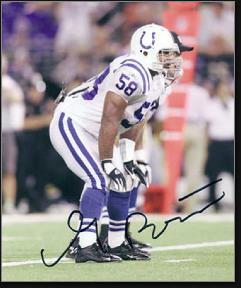 In 2006, was named defensive captain of the Colts and topped 100 tackles for the second year in a row. In the payoffs that year, he played well against the Ravens and Patriots as the Colts won the AFC title. In Super Bowl XLI against the Chicago Bears, he led the team with 8 tackles as Indianapolis won 29–16. Gary remained the team’s starting middle linebacker and defensive captain through 2010. In 2007, he had a career-best 4 interceptions; in 208 he returned a fumble 68 yards for his second and last NFL touchdown. An injury in 2011 ended his career. Gary earned an MBA after retiring from the NFL and put it to work as an Indianapolis restaurateur. His eateries serve dishes inspired by the Sunday meals his father made while he grew up with in South Jersey. His first job as a teenager was as a dishwasher at a restaurant in Glassboro, so in a way he has come full circle. He also started the IMPACT Foundation, which promoted health and education to children who are mentally challenged, physically challenged, socially disadvantaged or economically disadvantaged. In 2014, he published his autobiography, entitled Winning: From Walk-On to Captain in Football and Life.